Bastar district in southern Chhattisgarh has witnessed more forest fires between April 1 and May 5 this year as compared to Uttarakhand’s Pauri Garhwal, the Forest Survey of India (FSI) data shows. In fact, the state is on the third spot among those that witness such occurrences. Nevertheless, the Uttarakhand incident got all the media attention and there were reports of how the raging inferno engulfed the pine vegetation in the hilly state. 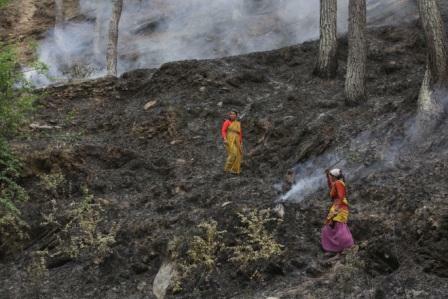 As per the information accessed by Down To Earth from the FSI’s satellite data, Pauri Garhwal recorded 471 instances of forest fires, the highest in Uttarakhand, while Bastar recorded 555 such instances. But when it comes to rankings, Uttarakhand tops the list with 1,395 forest fires followed by Odisha which recorded 1,346 fires and Chhattisgarh that witnessed 1,309 such incidents. North-eastern states such as Assam and Meghalaya also recorded high instances of forest fires mainly due to the prevalence of jhum (shifting cultivation) during the same period. Is the focus not on Bastar? There is no comparison between Pauri Garhwal and Bastar in terms of size as the latter is twice the size of the former, occupying over 10,755 square kilometers. Of this total area, almost 60 per cent are reserved forests. Activists said instances of frequent forest fires in Bastar were caught by satellites. “There is a complete apathy in fighting forest fires in the state (read Chhattisgarh). In many cases, forest fire instances occurred in the forest range offices, but were largely ignored,” Alok Shukla, a forest rights campaigner with the Chhattigarh Bachao Andolan (CBA), said. CBA is a grassroots organisation. Bastar district forest officer Anurag Srivastava, however, countered the allegation made by Shukla and said that the district was monitoring forest fires through a satellite-based software. “As soon as we see a red dot on the map pertaining to our district, we notify the range forest officer, who mobilises the team to douse the flames. However, with inadequate manpower it is difficult to reach some of the locations,” he said. Interestingly, the local forest department figures show only 100 fire instances as compared to the FSI data. There are also differences as to the causes behind forest fires. According to Srivastava, most fires are caused by mahua flower collectors when the season begins in February and goes on till April. “In order to collect mahua flowers and initiate coppicing in the stumps (coppicing is the process of cutting or burning down trees, thus allowing stumps to regenerate after a number of years), the forest floor is set on fire which goes out of control on many occasions,” he added. Shukla, however, defended the flower collectors by saying that even if forest fires are caused due to mahua flower picking, it is done in a controlled manner. “Adivasis of Chhattisgarh know how to manage such fires. From the ground, we have got reports of tendu traders setting patches of forests on fire to quicken the tendu leaf collection,” he added. Tendu leaves are used to make bidis. The activist rued the Chhattisgarh government’s apathy towards the implementation of community forest rights in the state as one of the main reasons why forest fires have increased. “Till the time, the onus of managing forests by communities that depend on them is not granted to gram sabhas, fires will keep occurring. As of now, the forest department is the custodian of reserved forests where the fires are taking place and so the responsibility is theirs. Earlier, villagers would help forest officials in fire-fighting, but now they fear that may be persecuted for entering reserved forests,” he added. To support his views, Shukla cited the case of Ghatbarra village in Hasdeo Arand region where community rights of the villagers were rejected by the state government as it fell under a coal mining lease. “In order to clear large swathes of forestland quickly, mining companies, in connivance with contractors, often set forests on fire which no one talks about,” he added. Among other causes identified by both the forest department and rights activists are lack of fire lines, use of inflammable objects and smoking inside forests as cause of forest fires. Another cause on which both agree is the prevailing drought in Chhattisgarh. The Raman Singh government had declared 80 per cent of the state as drought affected in 2015. The situation has not changed much this year. “Drying up of water sources has made the Sal forest dry, making it really vulnerable,” a forest official told Down To Earth. Union minister for Environment, Forests and Climate Change Prakash Javadekar has informed the Parliament that till April 21 this year, 20,667 instances of forest fires occurred in different states of the country as compared to the total annual figure of 15,937 recorded in 2015. The other important area which is famous for Red Sanders that get fire very frequently was Sheshachalam -- Tirumal-Tirupathi, the ebode of Lard Sri Venkateswara. These are man made, similar to cutting the trees.